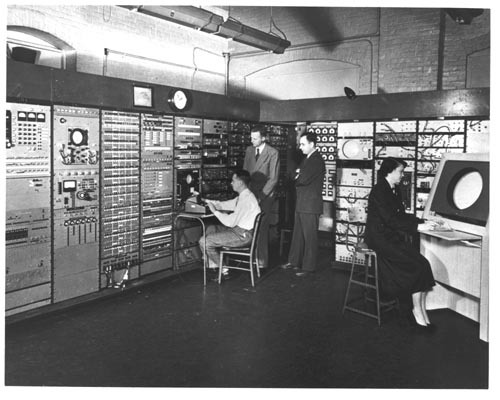 Black and white image of the MIT Whirlwind control room. From left to right: Stephen J. Dodd, Jay W. Forrester, Robert R. Everett, Ramona Ferenz. The control room has a vast array of cabinets with meters, levers wires and switches. Verso paper stickers: "80% p.17 B&W sq". "T.O.C -s/s (p-1) DUOTONE".